Our living earth nurtures oceans, continents and life. The earth’s diversity is formed by the intensive changes of the interfaces of the earth’s interior, such as boundaries between crust, mantle and core, and plates. In addition, various phenomena observed on the earth are interconnected one another, which include earthquake and volcanic events, mantle convection, plate motion, seismic activity, plate formation and movements from the magma activities, water and carbon cycles in the earth’s interior which form deposits and geothermal resources, and deep subsurface biosphere. Understanding the unified system of the mother earth, ocean and life in its exact nature will lead to obtaining more reliable knowledge of the earth on what happened in the past, what is happening now, where human race originated from, and where evolution is heading. With these purposes, we explore the deep earth. The earth’s interior has accumulated information on the earth, and also has some areas where the ongoing dynamic events can be observed with high accuracy. Working together with domestic and international scientists, we promote International Ocean Discovery Program which is led by Japan. Dr. Yasuhiro Yamada, DR. Moe Kyaw, and DR. Adam Wspanialy visited King Abdullah University of Science and Technology (KAUST), and Dr. Wspanialy and Dr. Yamada gave lectures to Ali I. Al-Naimi Petroluem Engineering Research Center (ANPERC) and as an Earth Science and Engineering Graduate Seminar respectively. An article, Scientists study huge subsurface biosphere, published on NHK WORLD. Dr. Fumio Inagaki had been interview for the article. [Column] Preliminary report of 6 February 2018 MW 6.4 Hualien, Taiwan, Earthquake, has been published on JAMSTEC News in collaboration with Dr. WU Hung-Yu. An article, A smart place to work, published on Nature.com. Dr. Kyaw Moe had been interview for the article. An article about the submerged continent, Zealandia, appeared on Sankei Shimbun newspaper. Dr. Saneatsu Saito leading the Drilling Informatics Research Group had been interviewed for the article. An article about the submerged continent, Zealandia, appeared on Mainichi Shimbun newspaper. 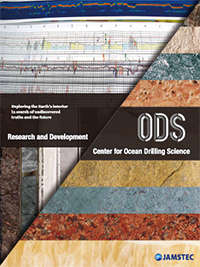 Dr. Saneatsu Saito leading the Drilling Informatics Research Group had got interviewed for the article.